"What seems to be the problem?" 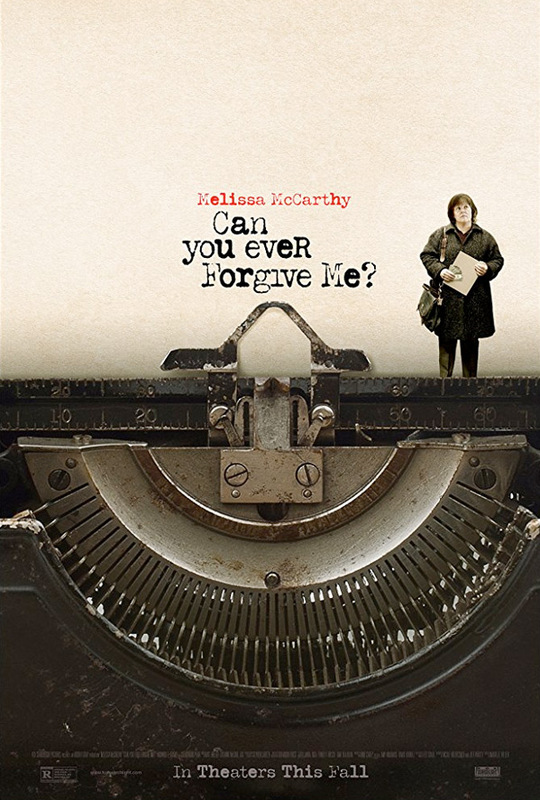 Fox Searchlight has debuted an excellent first trailer for the new film Can You Ever Forgive Me?, about author Lee Israel, played by Melissa McCarthy, who made her living in the 1970's & 80's plagiarizing from other famous authors. This is the new feature film made by filmmaker Marielle Heller, who made the outstanding indie debut The Diary of a Teenage Girl. Heller is one of my favorite filmmakers on the rise, and I'm so happy to get a glimpse at her latest. This looks delightfully droll, and entertaining in weird ways, but I'm still into it. The cast includes Richard E. Grant, Jane Curtin, Dolly Wells, Michael Cyril Creighton, Jennifer Westfeldt, and Anna Deavere Smith. This is a seriously great trailer for a film that looks exceptionally good. McCarthy giving a helluva performance, too. Melissa McCarthy stars in the adaptation of the memoir Can You Ever Forgive Me?, the true story of best-selling celebrity biographer (and friend to cats) Lee Israel (Melissa McCarthy) who made her living in the 1970's and 80's profiling the likes of Katharine Hepburn, Tallulah Bankhead, Estee Lauder and journalist Dorothy Kilgallen. When Lee is no longer able to get published because she has fallen out of step with current tastes, she turns her art form to deception, abetted by her loyal friend Jack (Richard E. Grant). Can You Ever Forgive Me? is directed by American filmmaker Marielle Heller, of the outstanding film The Diary of a Teenage Girl previously, as well as some TV work. The screenplay is by Nicole Holofcener and Jeff Whitty, based on the memoir by Lee Israel. The film hasn't premiered at any film festivals yet. Fox Searchlight will open Heller's Can You Ever Forgive Me? in select theaters starting October 19th this fall.